With the holidays right around the corner, this year you should make an awesome investment for your family’s future and a lifetime of memories. 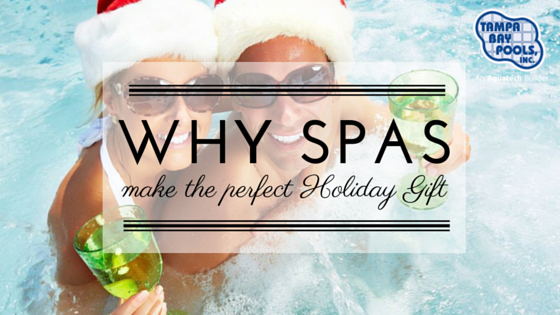 Hot tubs are an amazing holiday gift that will provide not only memories for a lifetime, but also many health benefits. This Christmas, purchase a perfect, brand new hot tub, with the help of Tampa Bay Pools, and find out why it is the most amazing, perfect holiday gift. The holidays bring stresses; stresses that can keep you awake at night. The relaxation and massages of a brand new hot tub can not only bring you comfort, but can also stir your body into having a great night’s sleep. It is vital that with all of the stresses that the holidays bring that you are well-rested and ready to tackle whatever comes your way. Do not miss out on your valuable beauty rest this holiday season. When the seasons and the weather changes, many people have a shift in their allergies or sinuses. Nose bleeds, stuffy noses, and coughs are all common when this happens. If you were to buy a brand new hot tub, those problems will begin to fade away. The steam and the heat from the tub can open up the sinus and really help with those deep respiratory issues. Spend your holiday in peace, not misery with the sniffles. As we all know, Christmas can get really expensive very quickly. With money being stretched tight around the holidays, it has never been more efficient to own and operate your very own hot tub. The newer, more energy efficient models of the new age run much better than their older counterparts, sometimes costing as little as $10 a month to run. So when the holidays roll around this year, save a little cash in your wallet. The holidays are the worst time to try and stay in shape, what with all of the turkey and eggnog being passed around. This can cause a massive spike in the number of people headed back to the gym. When you buy your new hot tub this holiday, you will eliminate the need for this. Hot tubs cost much less than a gym membership every month and you can still get a truly healthy workout just from exercising in the comfort of the water. Your backyard is the showcase of your home. As such, it deserves the pristine luxury that comes with a brand new hot tub. Turn on the LED’s, crank up the tunes, and gather the family around to enjoy the most fun, festive time of the entire year. You and your family will not regret it. Buy your new hot tub just in time for the holidays by contacting us today for further information.